Enclosed you will find this years edition of the Fall Newsletter. The past year has been a busy and productive year for the Society, highlighted by the fantastic Annual meeting in Newport, RI and the Spring Symposium on Periorbital rejuvenation in New York City. Please read Dr Babak Mehrara's President's Address for full details of the year. I hope you will attend the 2018 Annual Meeting later this month, in Boston. The agenda is packed full of innovative and exciting topics, and as we are all aware it's meeting colleagues we do not see frequently enough which makes the meetings special. Please come to catch up, relive old and make new memories. 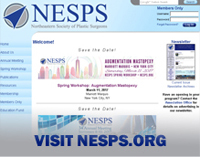 This year the Spring Meeting will be co-hosted with the New York Regional Society of Plastic Surgery on March 2nd at the Lotte New York Palace. The topic will be rhinoplasty and the invited faculty is outstanding. Please support the program and encourage your faculty and residents to participate. The meeting is 1 day long but packs in the essentials of the chosen topic focusing on clinical pearls and interactive discussions among regional and national experts. From the enclosed Program Update you will see that the Northeastern programs are leading the nation, the level of research grants awarded and honors bestowed are second to none. I would like to thank the busy Chairpersons, Program Directors and Coordinators who took the time to complete the survey: I know it takes significant time to do this thoroughly. It is great to get this snapshot of what each program is doing so again, thank you! I would like to invite our members in private practice to submit updates to me via my email, dmo9004@med.cornell.edu. They will be included in next years Program Update in a Private Practice Update section.